These designs were used on some large circular mirrors made for a small company called Wild Iron, back around 1999. The way I first came back to drawing (after 10-15 years) was: our neighbour, Karol, came over one day and happened to complain to Jill that she'd hired a graphic artist to draw a cat for her for a sign, and he'd done a picture that was okay, but completely useless for her purposes. He hadn't listened to the brief at all! Anyway, Jill told her I could draw and to come over later when I was home. Karol told me what she wanted and I sat down, drew it, and she used it (on a sign over a shop in Prahran). Karol was doing all kinds of metalwork in a workshop in her backyard and had moved into making mirrors, candlebras and various other sculptures, and getting dishes painted with designs, so I started churning out pictures for. Even though I soon after lapsed into one of the worst depression periods of my life, having begun to draw again made an inexplicable difference and helped me get through it. The major things I designed for Karol's Wild Iron were metal mirrors with dragons and sea creatures. The initial design was inspired by the patterns of a tattoo, and I then thought of a range of different sea creatures (real and imaginary), which I worked up as patterns and swirls. These were laid out between two circles to form the pattern surrounding a round mirror (if I had a digital camera, I'd put up a picture). I was really pleased with these designs and have used one of them again recently in another picture, but that's another story :). If by chance anyone actually ends up wanting to commit one of these to their skin, please let me know! I don't have any tattoos myself (the permanence and lack of lasting quality worry me), but I do appreciate the design. One trace, perfect for stencils or tattoos, beautiful designs ! i don't want any tattoos, but i do like the design of the dolphin very much..
once, a long time ago, i had a friend who wanted a tattoo.. so for his birthday i gave hime one, the head of a wolf... very nice, he loved it..
but his mother was not so happy.. he was so perfect when i delivered him, she used to say..
Great tattoo design, my favourite is the dolphin. i like them all and it turned out beautifully in the mirror. yes,it would be great for tattoos, too. That is you in the picture with Karen isn't it. i have also came back to drawing again last year since i made my last in 1985. ohhh life! I would be honored to have one of these tattooed on my body. Really nice. Love the mermaid, natch!! Thanks for comments! 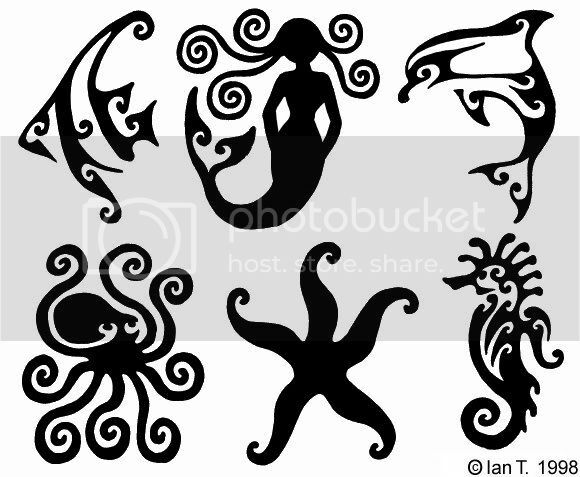 I can see that the dolphin and mermaid are emerging as favourites, and I can see why, though I have a soft spot for the octopus. Essentially, they had to be designed in as few "cuts" as possible, even down to one cut in some cases. Isay, it's strange the way these things happen, isn't it? It's Jill and me with the cat sign and Karol in the mirrors. Jody, woohoo, thanks I'm sure they'd look great there! The starfish for me, maybe right above the ankle. These are great! great story, have you ever submitted your designs to tattoo mags or shops for use as flash? I like the way your images flow. Personaly, I've never seen the point of having something personaly dyed into my flesh, but to each his own!